The Loves Me Not Season : Krulwich Wonders... People are watching as you change your Facebook status -- not only your soon-to-be-ex, but also trend trackers. Turns out a popular time to break up is right before the holidays. Could it be the economy? Breaking up now does mean one less gift. Take a look at this graph. Take a very close look if you have recently fallen in love. This is David McCandless and Lee Byron’s "Peak Break-Up Times" calendar, where they chart the times of year when couples tend to call it quits. We are entering the End-of-the-Year Danger Zone. I saw this first on David McCandless' Information is Beautiful site. McCandless and Byron searched through public Facebook records looking for the keywords "break up" or "broken up," then arranged the change of status updates on a calendar so you can see when couples tend to dissolve. If you turn this graph upside down you will see that August and September are the "We're Together Peak" months. After that, the trouble begins. This graph has been circulating for at least a week, so a lot of people have seen it. But I want to think about it some more. A provocative infographic can be approached in two ways: You can challenge it (this isn't true!) or you can believe it (why is this true?). This can't be an accurate description of our general population. It comes from Facebook. When this data was collected two years ago, Facebook was mostly college students. Do older people follow this pattern? Now that there are more older people on Facebook, how would the pattern change? Would summers be as couple-friendly? Would Spring Break be as break-uppy? Why do breakups increase around Valentine's Day? That doesn't seem right. Is there something about springtime that makes all couples fragile? Would the March pattern hold for 30-somethings? 40-somethings? 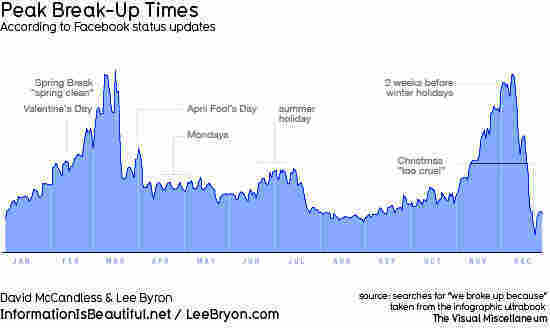 Why the April Fool's Day Spike of Unhappiness? I can't think of a reason. Are people more coupled in July, August and September because it's warm and sunny? Do Australians (where July, August and September are wintry) have the same pattern? Why is the Christmas holiday season so hard? Is it "I can't bring him home to my parents?" or is it "I can’t spend another 24 hours with her"? 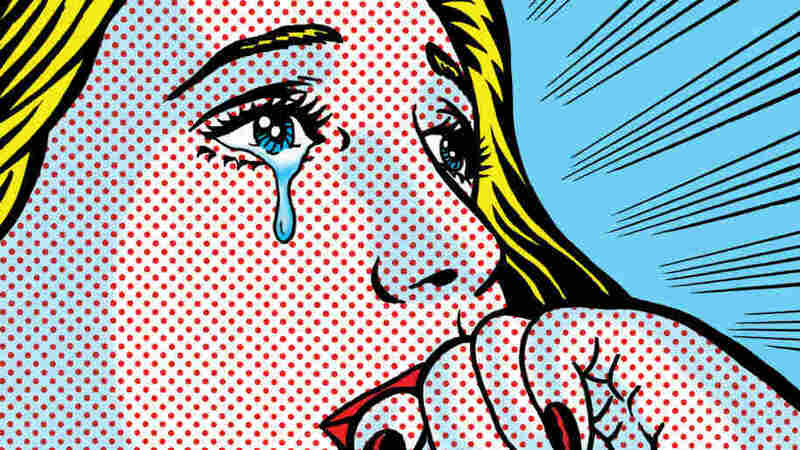 Why do break-ups drop so drastically two weeks before Christmas? That's when people are presumably buying presents and spending money. Is this an economic thing? Break up now and save $79.95? The authors say it's "too cruel" to break up on Christmas. Maybe people just don't change their status on that day. It could be a My Computer Is Off day. David McCandless and the young designers he features on "Information Is Beautiful" are brilliant at turning surveys, maps and government data into smart, provocative short stories. Their infographics seem so compelling, I usually stare at them and say, "Wow!" But more and more often I feel like somebody in a movie theater watching a pseudo-documentary. I think: Is this true? What if it is? What if it isn't? It's fun to look at McCandless' work with a suspicious eye, with a little dose of "Hmmmmm…"
In that spirit, I'd be very interested in hearing from you folks in the Great NPR Cybersphere. When you look over the Break-up graphic, what do you see? What do you believe? What do you doubt? What did you learn? Let me know.